PCORI developed its Dissemination and Implementation Framework to facilitate strategic planning for its activities to increase the awareness of evidence and promote its integration into practice. The Framework illustrates our commitment to increasing the relevant knowledge available to people and organizations to support their health decisions. To be effective, dissemination and implementation activities must reflect the concerns of end-users. For this reason, development of PCORI’s Dissemination and Implementation Framework drew heavily on stakeholder input. In July 2013, PCORI hosted a webinar/roundtable to launch the process of establishing a dissemination framework and toolkit. More than two dozen experts joined PCORI staff in a discussion of topics including the role of stakeholders in providing guidance on how to best disseminate PCORI’s research results, potential barriers to successful dissemination and implementation of research findings, and ways to reduce these barriers. During the next year, PCORI collected input from patients, caregivers, physicians, and nurses using a crowd-sourcing tool, and commissioned Mathematica Policy Research to begin work on developing the framework. Mathematica and its partners, AcademyHealth, Palladian Partners, and WebMD, led a workshop in December 2014 to gather input from dozens of industry stakeholders and partners, as well as the public. Based on this input and informed by a review of existing dissemination and implementation frameworks, the PCORI Dissemination and Implementation Framework was completed in February 2015. 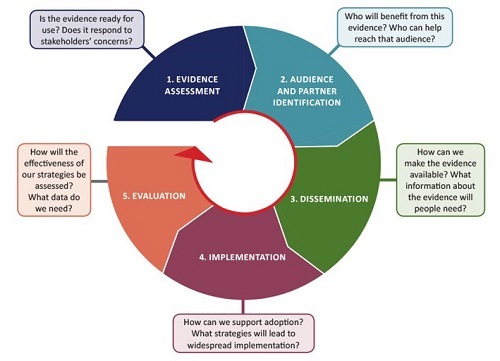 PCORI’s Dissemination and Implementation Framework contains the following core elements: Evidence Assessment, Audience Identification and Partner Engagement, Dissemination, Implementation, and Evaluation (see Figure). The Framework and Toolkit elaborate on steps to address each of these elements. Because PCORI research addresses a range of topics, settings, and populations and is relevant to a broad array of stakeholders, the authors of the Framework recognized that the processes through which evidence is adopted will vary by context or setting, and by type of evidence. For this reason, ongoing engagement of end-users is central to the success of dissemination and implementation initiatives.